Admit it. You've dreamed of owning your own Travel Trailer Toy Hauler for a long time. Here at Lakeshore RV Center, we want you to reach your dream! There's no better time than now, and no better RV than this 2019 Forest River Grey Wolf Travel Trailer Toy Hauler! All of us at Lakeshore RV Center are dedicated to helping you every step of the way, from first look to final sale. We're the #1 RV dealer in Michigan, with the best prices and best financing in the country! Come in and see us at 4500 E Apple Ave Muskegon Michigan 49442 if you're in the neighborhood! If not, just give us a call at 231-788-2040. Either way, we'll make it happen for you! This handsome Toy Hauler is 30' 8" long, 8' 0" wide, with a hitch weight of 775 lbs. 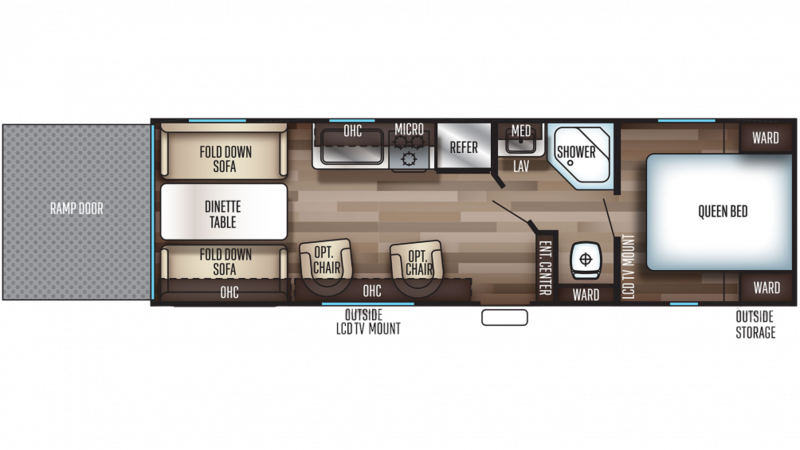 The 15' 0" patio awning opens easily so you can relax outdoors in shade and comfort, and the sturdy GVWR of 7775 lbs means this RV will provide you with years of camping fun! No one will ever feel cramped in this roomy Toy Hauler! It's 30' 8" long, 8' 0" wide, and has slides to maximize the living space! And the modern 13500 BTU a/c unit, together with the efficient 20000 BTU furnace will keep the climate inside your Grey Wolf 26RR comfy and cozy, no matter what the weather is doing outside! Everyone in the family will find somewhere cozy to sleep, with enough comfy sleeping accommodations for up to 4 people! You and your spouse can drift off to sleep with absolute ease inside the master bedroom, on top of its extra snug Queen bed! With the bathroom's Foot Flush toilet, you won't need to take a trip out to the communal bathroom! The 40 lbs. of LP tank capacity provides hot water for long, refreshing showers. Don't worry about overfilling the 38 gallon gray water tank and the 38 gallon black water tank! If your camping fun involves kayaking, snowmobiling, dirt biking, or riding your ATV, then the Grey Wolf 26RR is made for you! The easy access garage is 16' 3" long and sturdy 2745 lbs. of cargo capacity will handle your favorite toys with ease!